(Kerala) – The death toll from the worst flooding to hit India’s Kerala state in a century has jumped to 357, authorities said, with losses to infrastructure estimated at some $3 billion. 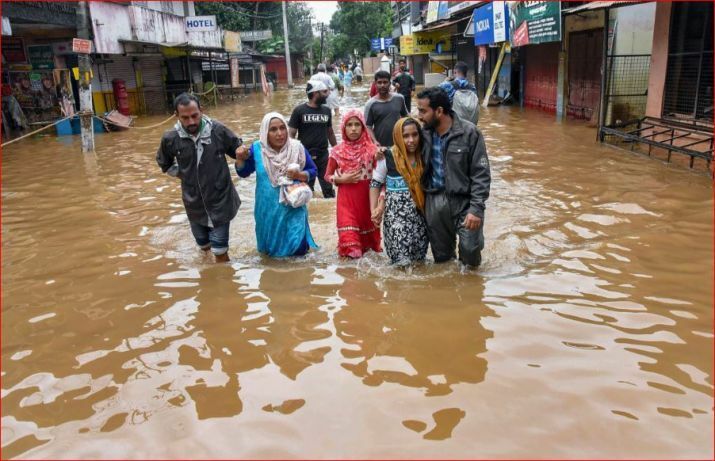 “Since May 29, when the monsoon starts in Kerala, a total of 357 people have lost their lives until now,” a statement from the state’s information officer said,. Some 353,000 people have taken shelter in 3,026 relief camps as thousands of army, navy and air force troops fan out to help those still stranded. Roads and 134 bridges have suffered damage, isolating remote areas in the hilly districts of the state which are worst affected. A total of AED10 million has been collected by the Khalifa Bin Zayed Al Nahyan Foundation through UAE-based Indian tycoons and businesses for Kerala flood victims, a few hours only after the Foundation had launched its relief campaign in response to the directives of UAE leaders to form a national emergency committee to provide assistance to the flood-striken Indian state. Indian businessmen Yusuff Ali M.A., owner of the Lulu Hypermarket chain worldwide, and Dr. B. R. Shetty, Chief Executive Officer, Executive Vice Chairman of NMC Health PLC, have donated AED5.00 million each, in response to the UAE emergency campaign for standing by the flood-hit victims.